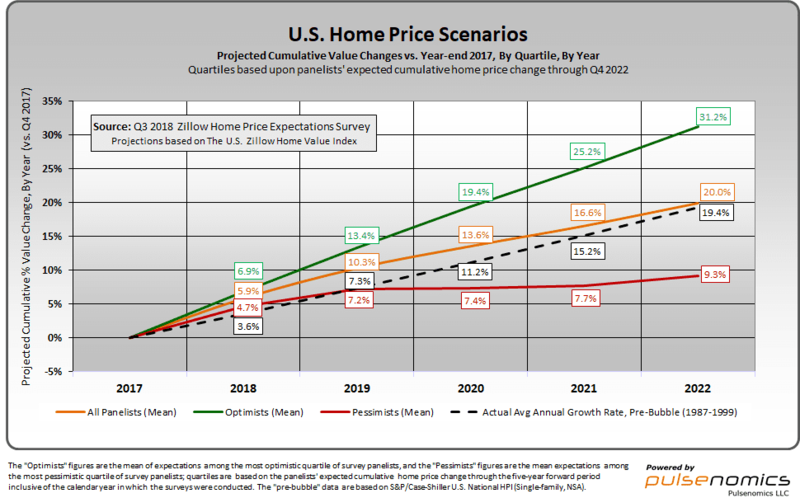 In addition to providing an update to the five-year outlook for U.S. home values, the Q3 2018 edition of The Zillow Home Price Expectations Survey–conducted by Pulsenomics LLC via an expert panel composed of more than 100 respected economists, housing analysts and investment strategists–delivered insights about when housing market conditions might shift decidedly in favor homebuyers. A plurality of experts who responded on this topic expect this shift to occur in 2020. With unusually low home inventory levels and rapidly rising prices, it’s been a seller’s market for U.S. residential real estate for several years running. At the regional level, Midwest housing market conditions are expected to shift a year sooner than the rest of the country. Nationally, home values are now expected to increase 5.9 percent this year. Although most experts have made upward revisions to their home-value growth projections from a year ago, those adjustments have primarily been to their near-term outlook. While ongoing supply constraints are reinforcing the floor on home prices right now, the experts’ Q3 forecasts still imply the joists will start to crack sometime next year, and result in sub-three percent annual home-value appreciation in 2020 and beyond. Another indicator from the Q3 survey is consistent with a shifting market. For the first time, a majority of the experts said that there is downside risk to their long-term outlook for home values nationally––and they outnumber experts who assigned upside risk to their forecasts by more than a three-to-one ratio.